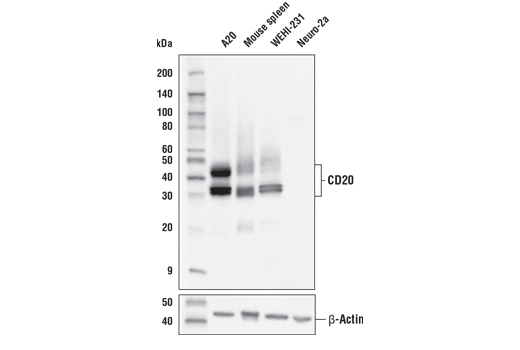 Western blot analysis of extracts from various cell lines and tissue using CD20 Antibody (upper) and β-Actin (D6A8) Rabbit mAb #8457 (lower). Confocal immunofluorescent analysis of colon from a syngeneic CT26 tumor-bearing mouse. 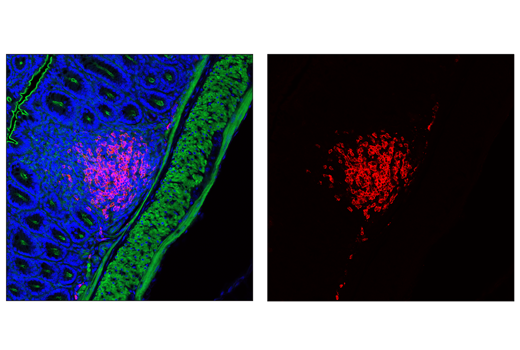 Sections were labeled with CD20 Antibody (red) and Alexa Fluor® 488 Phalloidin #8878 (green) before mounting in ProLong® Gold Antifade Reagent with DAPI #8961 (blue). 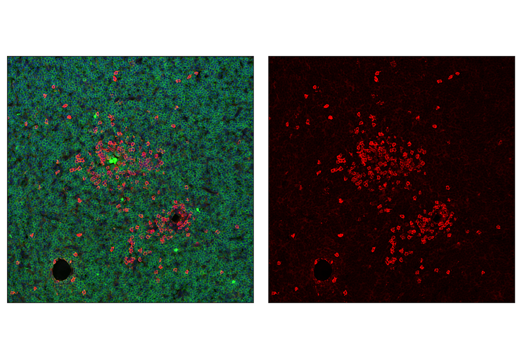 Confocal immunofluorescent analysis of lymph node from a syngeneic CT26 tumor-bearing mouse. Sections were labeled with CD20 Antibody (red) and CD3 (17A2) Rat mAb (FITC Conjugate) #86603 (green) before mounting in ProLong® Gold Antifade Reagent with DAPI #8961 (blue). CD20 Antibody recognizes endogenous levels of total CD20 protein. Polyclonal antibodies are produced by immunizing animals with a synthetic peptide corresponding to residues near the carboxy terminus of mouse CD20 protein. Antibodies are purified by protein A and peptide affinity chromatography. B-lymphocyte antigen CD20 (also known as MS4A1; Membrane-spanning 4-domains subfamily A member 1) is a cell surface phosphoprotein involved in the regulation of B cell activation and proliferation (1,2). It is commonly used as a marker to identify B cells and is expressed throughout B cell development, up until their differentiation into plasma cells. CD20 has no known ligand, and its expression and function are largely conserved between human and mouse (1-3). Evidence suggests that CD20 is necessary for store operated calcium (SOC) entry, which leads to elevated cytoplasmic calcium levels required for B cell activation (4-5). Anti-CD20 antibody immunotherapy depletes B cells by activation of the innate monocytic network and is a common treatment for B cell lymphomas, leukemias, and autoimmune diseases (6). Stashenko, P. et al. (1980) J Immunol 125, 1678-85. Tedder, T.F. et al. (1985) J Immunol 135, 973-9. Tedder, T.F. et al. (1988) J Immunol 141, 4388-94. Bubien, J.K. et al. (1993) J Cell Biol 121, 1121-32. Li, H. et al. (2003) J Biol Chem 278, 42427-34. Uchida, J. et al. (2004) J Exp Med 199, 1659-69.